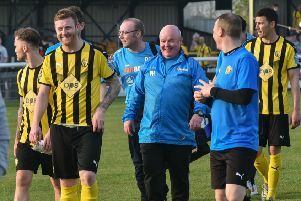 Another long away trip produced a promising performance for no reward as Brakes left West Yorkshire with a slim defeat to title-chasing Guiseley, who became the first side to prevent Paul Holleran’s men from scoring on their travels this season. A scrappy opening ten minutes produced little action of note, with Jamie Tank having to make a timely interception to cut out a cross from the right wing as Wayne Brooksby lurked menacingly. Brakes were maintaining a good shape early on, frustrating their hosts and denying them time and space. Oli Johnson’s shot from the edge of the area was dealt with comfortably by the returning Ross Atkins, while Danny Newton went even closer with a firm strike which forced Lions keeper Steven Drench to push the ball behind. The hosts came to life just before the break, Andy Holdsworth striking the bar with a free-kick. Atkins made a superb save to keep out a powerful effort from Jake Lawlor, while Johnson looked to have a tap-in, only to be denied by a clearance on the line as Brakes continued to stand firm. Lee Moore had shot saved early in the second half but it was Guiseley who took a 49th-minute lead, Gavin Rothery slotting home from close range after a good ball in from Holdsworth. Lions keeper Drench almost provided a chance for Leamington to level when he dropped a cross but he recovered quickly to smother the ball before Newton could get a touch. The Leamington striker did test the keeper moments later, however, with a long- range drive. Atkins was called into action again to keep out Johnson’s shot from a tight angle while another free-kick from Holdsworth flew over the bar. Stephan Morley sent a late drive whistling over the Guiseley bar but the promotion-chasing hosts claimed the points, leaving Brakes precariously close to the drop zone as they enter the Christmas period. Guiseley: Steven Drench, Andy Holdsworth, Ben Parker, Danny Lowe, Danny Ellis, Jake Lawlor, Wayne Brooksby, Danny Boshell, Adam Boyes, Oli Johnson (Alex Johnson, 72), Gavin Rothery. Subs not used: Kyle Harrison, Nicky Boshell, Jack Stockdill, Steven Dickinson. BRAKES: Ross Atkins, James Mace, Stephan Morley, James Fry, Jamie Tank, Delroy Gordon (Luke Connolly, 84), Lee Moore, Jordan Goddard (Aron Wint, 69), Dany Newton, Jack Edwards (Joe Magunda, 78), Matt Dodd. Subs not used: Martyn Naylor, Lewis Fenney.